Aquatic weeds can pose a whole lot of problems to the environment as well as humans. Water hyacinth is the most widespread and notorious aquatic weed that is found in almost all parts of the world. It has infested some of the major water bodies across the globe, thereby leading to numerous problems. So controlling spread of invasive water hyacinth is a necessity, for humans as well as other aquatic creatures, and the environment in whole. 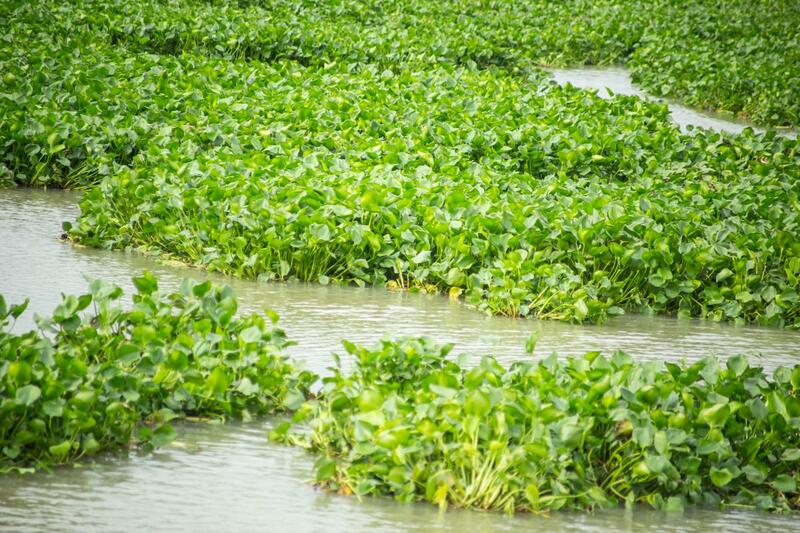 Methods of water hyacinth control are classified into three major types - chemical, biological, and physical. While chemical control is not favored due to the possible impact on the environment, physical control can be expensive and may not be suitable for controlling large infestations. Biological control is by far the most preferred method for eliminating water hyacinth. As the name rightly suggests, chemical control implies use of chemicals, in the form of herbicides, like 2,4-d, Diquat, Glyphosate, etc. Even though this method is found to be successful for smaller infestations, it may not be suitable for large areas. Another drawback is that you need skilled persons for application of these herbicides. Above all, these chemicals may cause some negative impact on the environment. They may affect the life of other aquatic animals, plants as well as humans, who use the water. It is said that endothall dipotassium salt is safe to be used for this purpose. However, if you are planning for chemical control, it would be better to hire professionals. This method refers to removal of water hyacinth from the infested water bodies. This can be done manually or with machines. While for smaller infestations, manual or physical removal is the best method; in case of large infestations, machines, like aquatic weed harvesters and crusher boats need to be employed. You may also require some terrestrial vehicles for transporting the weed removed from the water body. Even the cost of this transportation can be enormous, as these weeds are too heavy due to their high water content. Biological control of water hyacinth involves introduction of the natural enemies of this plant. They include insects, pathogens, and arachnids. Weevils, like Neochetina eichhorniae and Neochetina bruchi; moths, like Niphograpta albiguttalis; mites, like Orthogalumna terebrantis; bugs, like Eccritotarsus catarinensis, etc., are released into water bodies with heavy infestation of water hyacinth. Even domestic geese may work wonders, as far as water hyacinth control is concerned. These birds feed on this aquatic weed, thereby reducing the level of infestation. Even though biological control may take several years to show results, by far such methods are said to be the best, in terms of environmental safety as well as expenses. 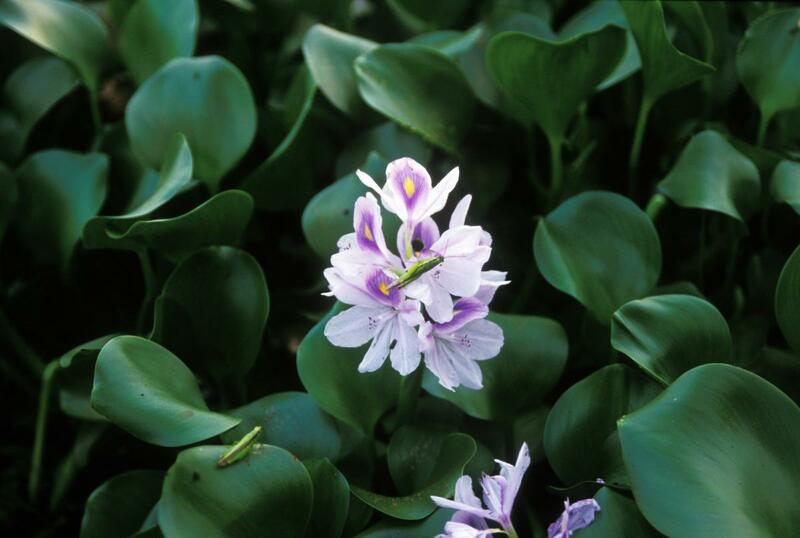 Water hyacinth is often found as floating masses with round, dark green leaves and purple/lavender flowers. This plant with a fibrous root system, spread very fast, as they propagate vegetatively and through seeds. It is said that only a few weeks are needed for the water hyacinth to cover a large area. It is commonly found in streams, lakes, ponds, waterways, ditches, marshy areas, and backwaters. These plants are also grown for ornamental purposes, and are sold by some garden centers. They are grown in ponds, due to the showy flowers and floating foliage. If not controlled properly, water hyacinth can take over the whole pond, thereby affecting life of other aquatic plants and animals. 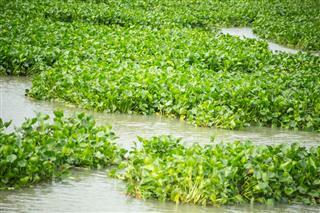 The uncontrolled growth of water hyacinth in water bodies has created a host of problems, like blockage of waterways. This affects navigation through lakes, inland waterways, etc. Intertwined water hyacinth form a dense mat that is impossible to cross. Even fishing will get affected by such infestation. Water hyacinth infestation is one of the major causes for clogging of irrigation pipes and intakes of hydropower systems. Even water supply systems and drainage systems can get clogged up with these weeds. These weeds can also cause floods, as they block normal water flow through the rivers and canals. In water bodies with water hyacinth infestation, loss of water through evapotranspiration is very high. As these plants can make the water oxygen-deprived, other aquatic plants and animals living in that water body will eventually get eradicated. Water hyacinth infestation creates a habitat for disease-carrying vectors, like mosquitoes, leading to health problems, like malaria, schistosomiasis, lymphatic filariasis, etc.